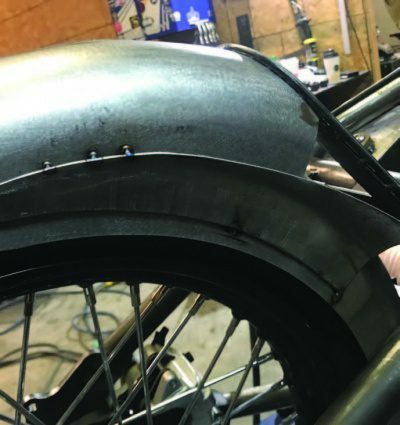 Ok so the plan was to make a tail section for the Twisted Tea Tracker that would transfer the skinny 19- inch rear wheel to the standard size frame without making it look like lips on a duck. 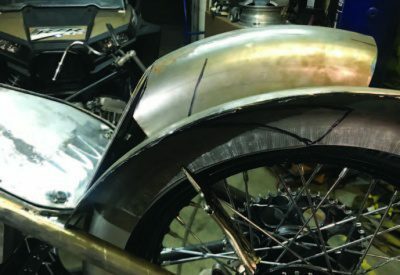 We wanted a somewhat cafe style tail section but didn’t want to take away from that skinny back end. 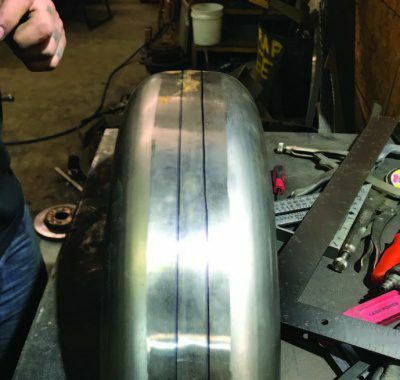 Now, usually this would have been done through hours and hours of forming a buck, then hand-forming sheet metal around it to get the exact size and dimensions you want, but we didn’t have time for that, so this tech article is a shortcut we found. We simply took sections of other fenders we had laying around the shop. Since they were the same radius, we could use them in different manners to get the desired results. In the end, we wanted to match the combination of the convex/concave style of the fuel tank, which would have been a real challenge without this happy accident. 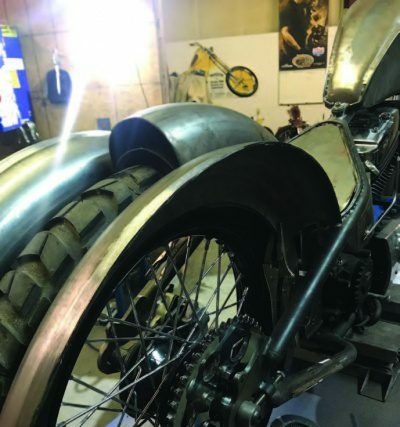 We start with the same practice, as usual, set up the fender for the correct radius using the Mittler Bros shrinker stretcher. No big deal here, set the height using an old piece of bike chain. Since the fender was 5-1/2 inches wide and the tire is only four inches wide, we decided to take an inch out of the fender to snug it up. A pretty easy trick is to lay it flat on its side on a table and measure up 2-1/4 from each side. Once our pencil lines are on, we mask them off, then apply machinist dye so we can see the line clearly when we cut. 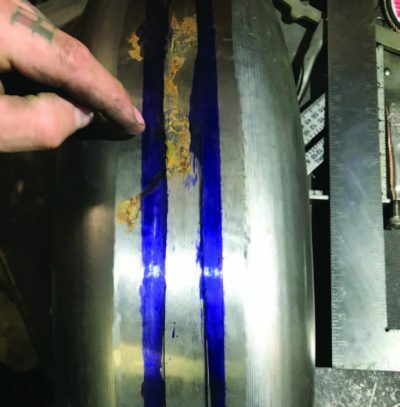 When the tape is removed, the blue dye stays and will remain visible through the entire process of the cut. 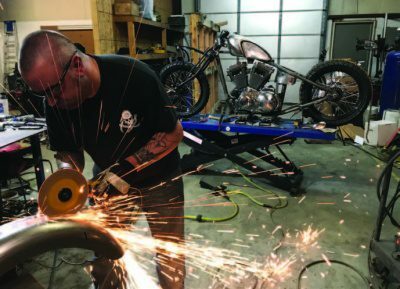 RJ is a master with the wheel of death, no there isn’t a guard on it, yes you should have one on yours before trying this at home. Here you can see how nice and even the cut is. 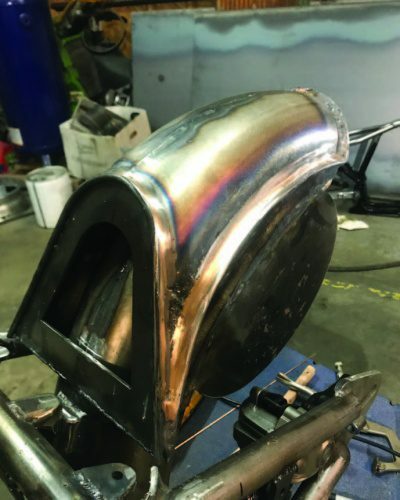 You should take time and fit the two halves before welding a sloppy or uneven seam. 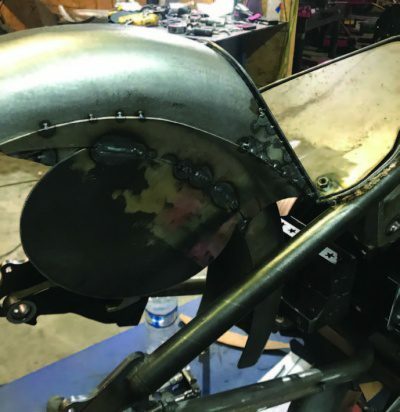 We tacked it in spots, then came back and did one inch at a time in different areas to let the heat dissipate, reducing the amount of warpage. 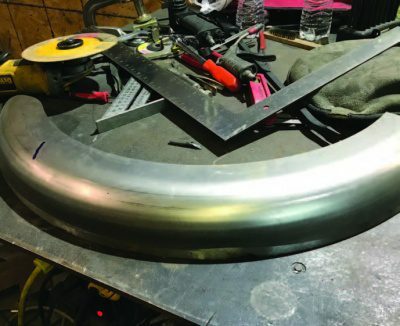 We needed a place to base our tail section from. RJ came up with this great seat backer that would serve both purposes. He cut this out with his Lincoln Plasma Table, and once we found the complementary angle, we welded it in place. I know, so where is the tail section? 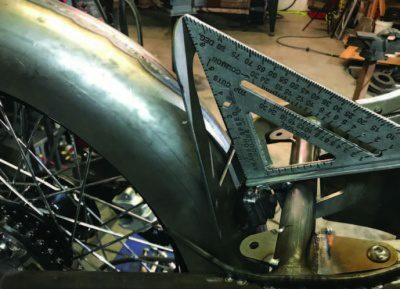 By utilizing the the fender we had previously cut to length it provided a top piece to fit up against the seat backer, like so. We also took the top section and narrowed it in the back so it would transition to our seat backer in a V shape. Now, here is where it gets interesting. 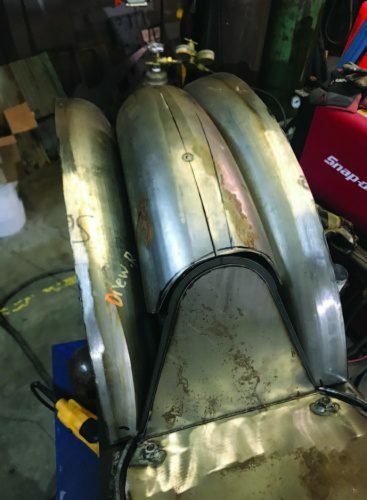 By taking another fender and splitting it in half and taking those halves and shaping sides with them, we had two side panels that would transition from the base fender to the top section in the exact radius we were using. Of course, these were way too long but one thing at a time. 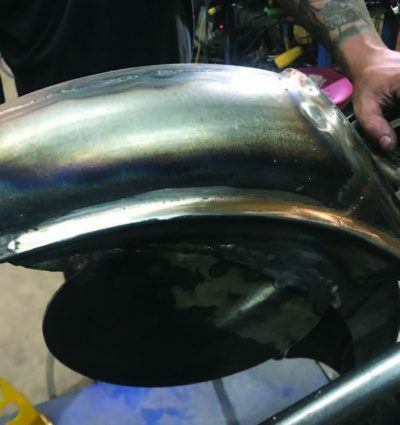 At this point, we make a simple seat pan that will pop right into our molding work and get it out to the seat guy. Here is a shot of the whole contraption from above. While there is still a ton of material to take off the sides, we have the length and the hard part, the reverse radius, has been done for us. This will save days. 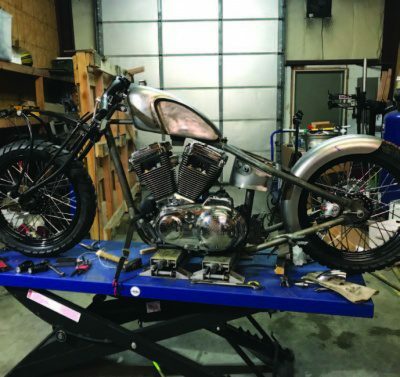 With the excess material cut away in a graduated line to make the transition from the seat rail of the frame to the tail of the fender, you can start to see what we are going after. 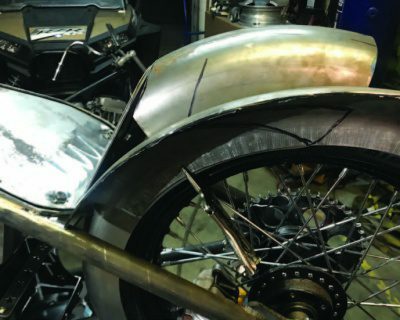 Here you can see the number plates will also fit just under the tail section and will also be kept tight up against the tire. We also cut out a small piece to fill in where the top section was short and started to take it all up. 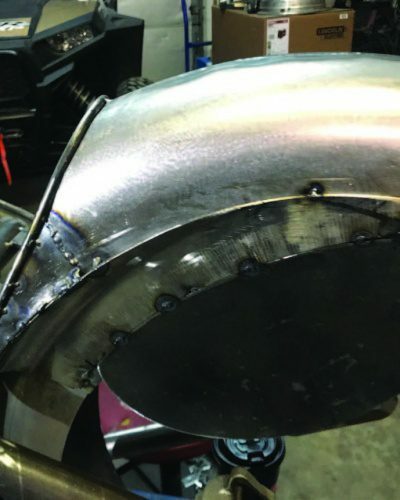 Here you can see that we have started to tack on our 1/4 inch round rod to match the molding lines of the fuel tank. 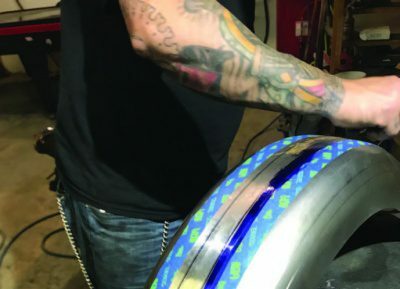 This will also go between the two parts of the fender to accentuate the concave/convex design. Here we have most of the silicone bronze work done. 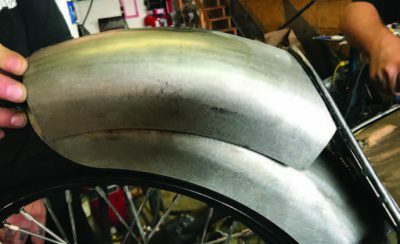 The idea here, if you haven’t heard us speak on this, is that we fill in the gap along the round rod with silicone bronze. This metal is softer than mild steel, so when we grind and sand it away, it smooths out nicely leaving a nearly finished seam. By this point, we are almost ready to prep this thing for paint. A few more hours with more delicate sanding work and it should be ready for primer and at most, a skim coat of finishing putty. Here is our finished piece ready for paint. 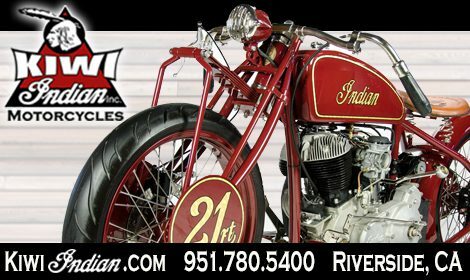 While we came about it in unconventional fashion, the result is killer, and we achieved al we set out for in the design principal. 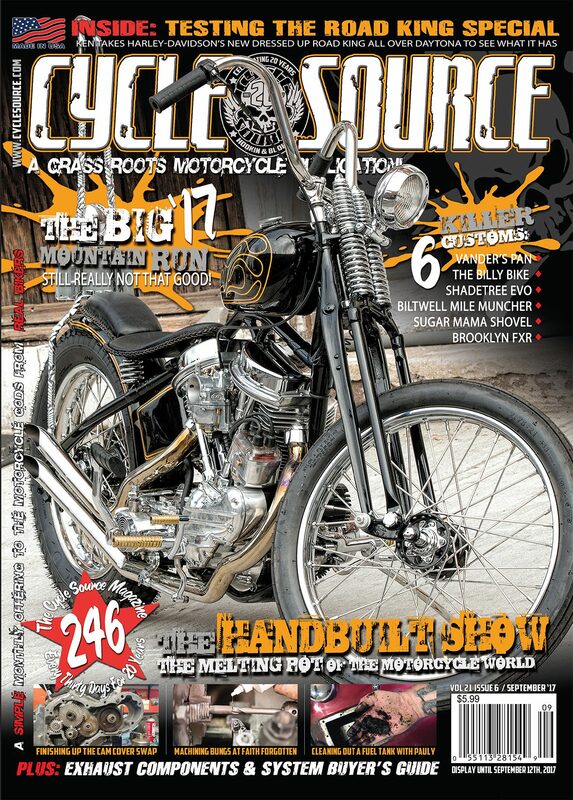 This entry was posted in Tech Tips/ DIY and tagged Back Issue, custom bikes, Cycle Source, Cycle Source Magazine, Flat Tracker, Tea Tracker, Tech, Tech Tips, twisted tea. Bookmark the permalink.